My first car, back when I was in high school (1977), was a '64 LeMans. 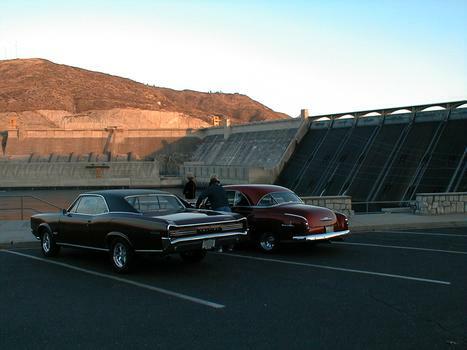 My second car was a '67 LeMans (I don't count the car I drove briefly inbetween these two - a '61 Comet! ), so as you could imagine, I always yearned for the big brother of the LeMans - the GTO! Years later my Dad got into old cars and bought a '51 Chevy, and started bugging me to buy a 60's era musclecar so I too could begin my second childhood. Time to buy a GTO! I started looking for the early body style of '64-'67, and was prepared to travel if needed. I looked online, found some nice possibilities, then got the idea to check the phone book. I called a few places, realized that it was a stupid idea (they're not sitting in the used-car lots), then got lucky and found this '66 nearby at Memory Lane Motors. I bought it in August of 2000, just one week before I was to leave on a vacation to Lake Chelan in Eastern Washington. Of course I wanted to drive my new car. I did the usual things to get it ready: oil change, lube the front end, check the tire pressures, etc. The day before I was to leave I thought I'd adjust the clutch freeplay. When I took a look at the clutch fork push rod (photo), my heart sank. Where the hell am I going to find a replacement? I don't want to break down in the middle of nowhere! I called around, and the best I could find was Kirkland Pontiac, who said they could have the part in on Monday. Cool, but that would be too late. I kept calling, was about to give up, and then tried Evergreen Musclecar. They had the part in stock. Lake Chelan here we come! A few years later my 389 was showing its age - burning oil, etc, so I decided to get it rebuilt. Because it's numbers-matching, I decided instead to pull it and buy a Pontiac 400 (much more plentiful) to rebuild. I found a 400 for $100 and took it to Dave Bisschop of SD Performance up in Canada. He's known as one of the top Pontiac engine builders in North America, so I knew I was in good hands. We decided to stroke the 400 out to 461 cubes and selected a solid lifter cam with duration of 256/262 at .050" lift. Dave ported my 6X heads to flow 240 CFM. The CR is a pump-gas friendly 9.5:1. 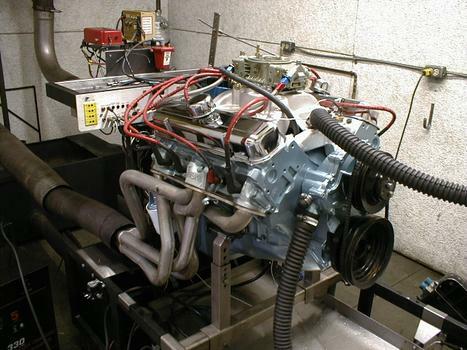 The dyno rated this bad boy at 474 HP at 5500 RPM and 534 ft-lbs of torque at 4300 RPM. Now that I could go, I needed to stop, so I installed a front disc brake conversion kit. While I was at it I replaced the ball joints, springs, bushings, tie-rod ends, center link, etc. The steering really tightened up as a result, and it was really nice to not have to plan in advance to stop. To eliminate the maddening wheel-hop, I boxed the rear control arms and replaced the bushings. While I was at it I replaced the stock 10-bolt rear end with a 12-bolt built by Bill Scribner. It is slightly narrowed and running Moser axles and weld-on C-clip eliminators. I went with highway-friendly 3.31 gearing and love it. Not great at the track, but the drop in RPM on the highway is a relief! The graph below shows the results of a chassis dyno tune done recently by Alex at Carburator Connection in Kirkland. Run 1 (red line) is the baseline. You can see that when I first floored it, it went really lean until the vacuum seconaries started to kick in. So we richened up the primary jets, make a few more runs, richened up a little more, then did run number 7 (blue). Now the lean spike is under control, but the torque is not responding as hoped. Alex advances the timing about 5 degrees, and Run 8 shows a nice improvement. Good to go! Now that's what I'm talkin' about!! 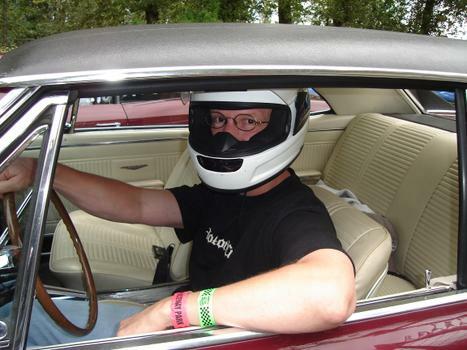 Owning a super looking car, and NOT being afraid to take it out on the dragstrip!! That's great!! Appreciate your comments on my 72 Charger. That's a terrific car you've got there. 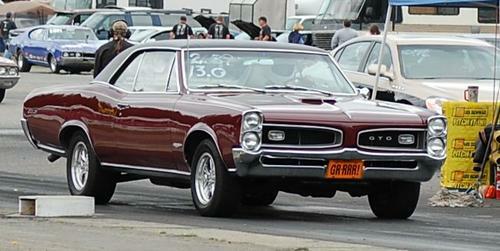 GTO was my second choice over Chargers. Bought mine in 1978...2nd owner. Keep it rolling and looking good. Brandon, thanks for the comment on my Bel Air. I'm diggin the GTO. I know what you mean about doing an engine swap. Mine does not have the stock motor, but it does have a very desirable '67 L79 with a power glide that are showing their age. It would be very easy to find a crate engine and 350 turbo, but I love the 2 speed and 327 combo, and hate to be stuck with a cookie cutter 350-350 like lots of others. When 2nd gear hits and you push all three carbs wide open, you have to ask yourself the question, do I really want to go faster? Brandon...Thanks for the compliment on my Riv. I really appreciate it. For some reason, I had missed seeing your GOAT until you posted. YOU HAVE ONE BEAUTIFUL & POWERFUL CAR. 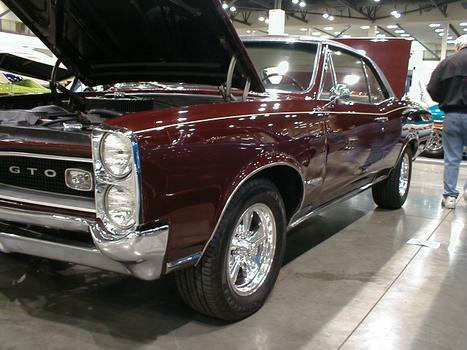 My first car was a '64 GTO, 389, 4spd. Like so many others, I wish I still had it. Thanks Dave! My first car was a '64 LeMans. Thanks for the comment. The paintjob started small then got a life of its own. Let my friend have his way with the car. Hooking up isnt to bad with drag radials and my tration control on. 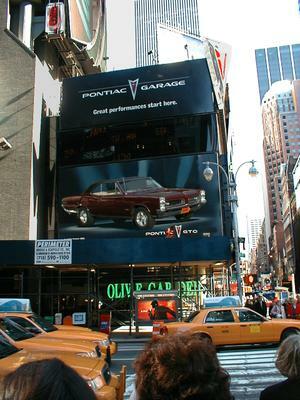 Thats one beautiful Pontiac GTO you have there.Nice to see other people out there enjoying their rides. No one ever believes me when I tell them the mileage I have on mine. 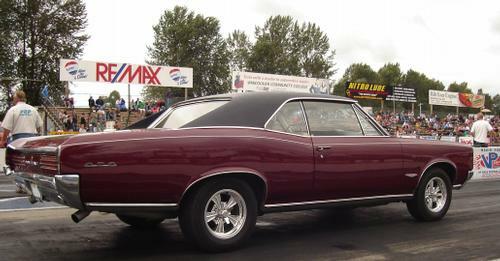 What wheel and tire combo is that ..I want to improve my 66 GTO. Which springs did you put in ..yours sits great. Thanks! I have 255/60 15" on the back and 235/60 15" on the front. Rims are Radir Tri Ribb (www.radirwheels.com). The front springs are for a convertible. I'd rather lower it about 1", but I was tired of scraping my headers. Please post your GTO! I'm not sure if the back springs are stock, but the back is a little high because I have air bags in the springs. I needed the air bags to keep the driveshaft loop from getting hit by the driveshaft. Convertible springs make it sit higher (convertibles are heavier). ..boy I wish you would teach me: I'd like to copy for my 66 Goat your dyno tune, your suspension, and many of your set-ups - but I'm in Miami and have no idea who could do what you know how to do..
Have always liked GTO s I used to be a painter at a Pontiac dealership in the 80s and 90s I have worked on a few. Have never had the privilege of owning one. Your car is a true "American Muscle" machine! 66' is best GTO ever produced! Great car, and very impressive Dyno results, kudos! Thanks, Rich! I added the size info to the spec table above. Note that my rear end is not stock. I think the tires and wheels fit OK before I changed the rear end, but don't remember for sure. Funny how things run similar in another person's life. I just bought a 1966 Pontiac Tempest that MAY become a GTO...someday. Right now it has the OHC 6 in it and I'm having fun with it's uniqueness. 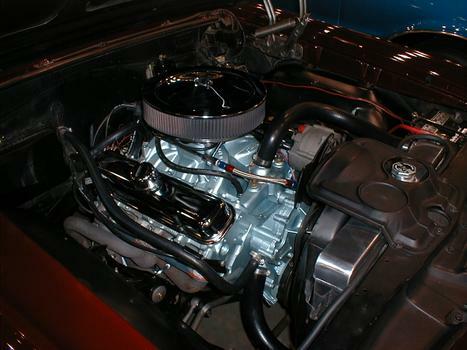 I had a 1965 COMET as my first "muscle car". I'm happy with my new 66 Tempest and I love everything you did to your ride Brandon. I hope someday to have my ride as nice as yours! Thanks for posting all the info pertaining to your ride. It helps us who haven't reached that level............................YET! Thanks, Rob! Your '66 Tempest running an OHC-6 is unique, and you have the 'Vette to go fast! Sweet ride Brandon I love goats my best friend had a 66 when we were kids boy do we miss that car! I also love the color scheme you have Burgundy is my favorite color ,Just make sure to keep her right side up ok signed Drlaguna. Cool, Nick, I didn't notice that at first! Tons of excellent information for others looking to squeeze out a bit more performance. The tail lights on the 66 were a styling triumph in my opinion. Gorgeous Goat! Just wanted to say I approve (not that it matters much) of the new choices for the cars for featured members rides. You do such nice work. Thanks, Rob! The toughest part is picking 4 from the many awesome rides posted on this site!